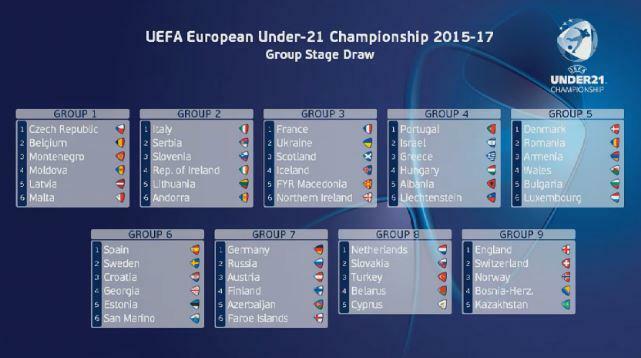 At today’s draw, Macedonia learned its opponents for the 2017 UEFA U21 qualifications. Macedonia was represented at the draw in Nyon, Switzerland by U21 manager Blagoja Milevski and U21 director Sasha Ćirić. The team was in pot 5, together with Bulgaria, Cyprus, Lithuania, Azerbaijan, Kazakhstan, Albania, Latvia and Estonia. The draw moved along pretty quickly with each pot, starting from the lower end (pot 6), being drawn into the nine groups. So, the first team drawn from pot 6 would go into Group 1, the second team drawn from pot 6 would go into Group 2, and so on. That process would repeat itself for the other five pots as well. Macedonia was drawn third from pot 5 by the UEFA representative, so they found themselves in Group 3. At that time, they knew that one of their opponents would be Northern Ireland (drawn in Group 3 from pot 6). Eventually, the other four U21 teams to be drawn in the group were Iceland (pot 4), Scotland (pot 3), Ukraine (pot 2) and France (pot 1). For this qualifying cycle, players will need to be born on January 1, 1994 or later to be eligible. So, a guy like David Babunski would still be available to play. 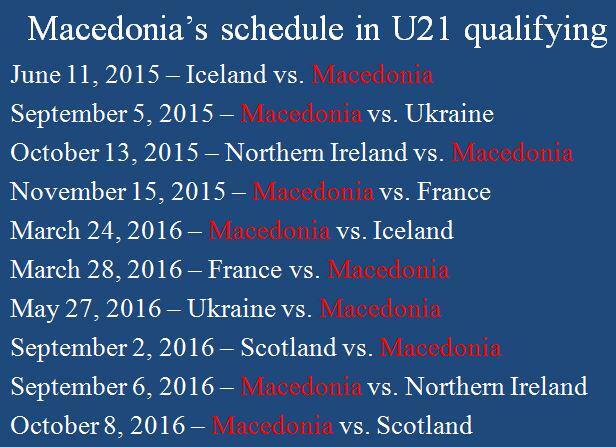 All of the qualifying matches (10 in Macedonia’s case) will take place in the span of 18 months (from March of 2015 to November of 2016). The nine group winners automatically qualify for the final tournament in Poland, while the four best runner-ups will enter a play-off. After home and away ties, the two winners of those matchups will also qualify for the final tournament. That’s 11 teams, while the 12th participant will be host country Poland (qualifies automatically). What do you think of the group? Manageable or difficult? Let us know in the comments section.